Publisher: Van Winkle and Wiley, 1815. Reprint Edition BeerBooks.com, 2007. Hard Cover, 158 pages, 6.25 x 9.25. In 1815, New York City brewer Joseph Coppinger wrote The American Practical Brewer and Tanner, one of the earliest brewing texts published in America. Coppinger had emigrated from England many years earlier, arriving in New York at a time when commercial beermaking in the young nation was growing, but far from mature. Coppinger saw the potential for a brewing industry in America that would one day rival that of Europe. At every opportunity, he promoted the health and economic benefits of beer, even making a personal appeal to President Madison, and later Thomas Jefferson, for the establishment of a National Brewery in Washington to help spur brewing nationwide. 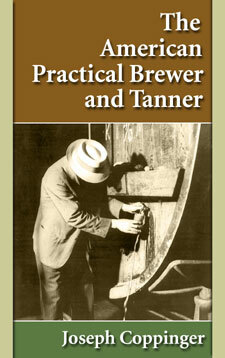 To make this early brewing text available to modern historians and brewers, BeerBooks.com has reprinted Coppinger's work. An original 1815 copy was transcribed, typeset and reproduced in a hard cover format. The American Practical Brewer and Tanner is the culmination of Coppinger's twenty-five years of experience as a brewer and maltster. He shares his wisdom on the proper location of a brewery, its architectural arrangements, and every practice and process performed within its walls. All aspects of the brewer's art, including the cultivation of hops and barley, are discussed in great detail, and in the colorful parlance of Coppinger's day. The result is an entertaining and educational glimpse into beermaking in early America. Though Coppinger saw fit to include a small chapter on the tanning of hides, only the final 12 pages are devoted to that topic. Brewing strong Beer with the extract only of the Hop, leaving out the substance. A simple method of giving new Beer all the qualities of age, thereby fitting it for the bottle before it is three weeks old. A simple method of preventing Beer bursting the bottle. An economical mode of constructing Vats above ground, possessing the temperature of the best cellars and thus rendered fireproof. An economical mode by which every Housekeeper may brew his own Beer. A method of brewing good Beer from Bran and Shorts, and of preserving it.